But I recognize that not everyone finds comfort in a group. And not every writer needs one. What makes one person thrive in a group, while another might warily keep her distance? This is probably oversimplified, but even though women are sometimes characterized as catty and backstabbing, I think we might be better with groups then men. And I think for me, having a sister only 11 months older who was utterly welcoming set my mental framework. I started out in a little pack and since then, have always sought one out. How about you, reds and red readers—are you happier trav’ling life in a pack? Or do you manage better on your own? JENN McKINLAY: I am definitely a pack animal, but I also need lots of alone time and am a-okay with traveling alone, so I think I have one foot firmly planted in each camp. Like you and your sister, my brother is only 11 months older than me and we did everything together as kids so I definitely am used to having a pal or hooligans by my side. That being said, I need to be alone to let my imagination loose. While at Bouchercon, I attended many events with friends, like dinner with the Reds, but I also cut out for a few hours on Saturday morning to go to the top of the CN Tower by myself and stomp around Toronto on my own. I am an active sort and I like to walk at my own pace, eat what I want, loiter where I choose, and people watch without having to converse, but then when I want a pack I go find one. HALLIE EPHRON: Pack animal here, guilty as charged. Particularly at a conference where alone I feel so self-conscious and anxious. In high school, my greatest dread was lunch because I did NOT have a group I belonged to. So I drifted trying to look busy, like I was going somewhere rather than admit that I was eating alone. I suppose if that's the worst thing that happens to you in high school, you've gotten off easy. Now I treasure my friends and a twosome or more some is my preferred way to spend leisure. Writing I like to do alone. But I'm also very social and love doing things with friends. I think it's a perfect mix. The extrovert fuels the introvert needed for writing and long stretches of time alone. HANK PHILLIPPI RYAN: Huh. That's a great question. I am often alone during the day, and that's more than fine. (Happy, too, when Jonathan comes home.) I am happy by myself exploring a strange place, happy with dinner by myself out of town. It's fun now, and I guess I learned it by begin a big loner in high school and college. But now I also adore being in a pack, hanging and flowing with pals. Dinner with a pal or two? Bliss. The Jungle Reds-in-motion? 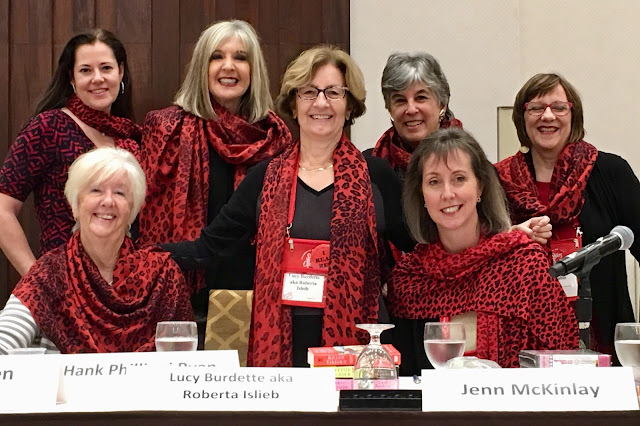 All wonderful, and our connections at Bouchercon still bring tears to my eyes. INGRID THOFT: I have three older sisters, so I grew up traveling in a pack. These days, I like a bit of both: Time spent with others, but also plenty of time on my own or with the hubby. I'm not wild about coordinating travel itineraries with others because I think that everyone has his or her own travel style, and it can be hard to mesh them. Do you like to get to the airport really early? At the last minute? Do you ever check a bag? What kind of accommodations do you prefer? I think it's great to meet up for meals or other events, but also to build in time for recharging my batteries without having to worry about anyone else's preferences. RHYS BOWEN: I'm definitely a pack animal too. Having been a solitary child, growing up at the big house in the country, I relished being in college and doing things with friends. I still do. I have had the same groups of hiking friends for thirty plus years. We have taken many fabulous trips around the world together and always have such a good time. However, there are times when I have overload and need to be on my own for a while, just to re-charge. JULIA SPENCER-FLEMING: I'm on the same part of the spectrum as Debs and Ingrid. I'm very sociable, and love being with friends. One of the things I'm being mindful of, since Ross passed away, is getting out of the house and meeting a friend or friends at least once a week. On the other hand, I enjoy time spent by myself: I love solo travel and what is nicer than staying by yourself in a good-quality hotel room? One of my most cherished escapes is spending a working week at my agent's house in Nantucket, all alone during the off-season. I'll see a couple of friends while I'm on the island, but most of the time, it;s just me and the book - and I like it that way. But when I'm at a conference or vacationing, I want to be surrounded by my people all the time. What's the point, otherwise? LUCY: And Julia, we cannot wait until you are traveling with the Red pack again soon! Red readers, are you a pack animal, or do you prefer to go it alone? Since I have a twin sister, I was never really alone when I was growing up. As others have noted, I, too, am a bit of both, although I tend toward being more introverted and am perfectly happy doing things by myself. Being surrounded by family and friends is a pleasure, but I’m not the person who can walk up to a stranger and strike up a conversation . . . . I imagine being part of a twin set would be very special Joan! Lucy, you are an Irish Twin since you have a sibling who is close to you (less than a year apart). Not exactly the same as same day same year birth, though. I am a loner at heart, perfectly happy to spend hours at a time with no other human in sight. I have a few close friends, and a ton of beloved colleagues at work, but I'll be honest: I got a full-time job and moved into town partly because I thought it might be prudent to live where other people might notice if I didn't show up where I was supposed to be one day. I'm about to head out for a long driving trip and, while I made plans to take one of the dogs along for company, I may just leave them all with the sitter. Despite a full range of flea and allergy meds, they've all come down with the itchies and it may be easier not to have to explain that to every innkeeper along the way. I love the Reds, and the community you have built here, but big conferences like Bouchercon can wear me out. I think I'm most like Jenn. I can mix and mingle and have a lot of fun meeting friends, but after a few hours I have to check out for a while and do stuff on my own to recharge. Gigi, it's really good to be in the conference hotel at Bouchercon or any of the big conventions. That way, when it gets to be too much, you can just nip up to your quiet room and put your feet up for a bit. I'm a mix of both as well. I like spending time with a groups of friends, meeting new people, and love to travel. But then, I need time alone to digest it all and recharge my batteries. One thing I have never been able to do--share a hotel room. Nope, even at cons, if I'm not traveling with hubs, I ask for a single. I'm with you on the hotel room, Kait. I really need to have "a room of one's own" when it comes to conferences. While I can make do within a group for whatever setting it might be, I am best when I am on my own. I can control my setting, do things how I want and on my own schedule. Even when I want to join in on a grouping, I have a hard time doing that. The latest example of that "problem" is when I went to a Halloween party on Friday night. So for the most part, I don't even try anymore and just stay on my own. As an only child and introvert, I am definitely a loner by nature and choice. But I do like being part of the Reds community and going to mystery conferences like Bouchercon (or Left Coast Crime) to see friends. But like others, I needed to recharge and do things on my own for a few hours each day after spending time at Bouchercon. And solo travel has been my preferred mode for decades. I should also note that for me, at least, my tolerance of crowds, hustle and bustle has decreased with age. Anyone else find that? Julia, it's no so much that I mind the crowds, but that my partial deafness makes large groups with a lot of ambient noise exhausting for me. And the really loud crowd noise actually hurts. Yes...I hate airports and malls! But don't like traveling or dining out alone...really want my friends along to share the experience. On the other hand, I'm fine alone at home with the dog, cat, TV and a good book! YES! Unless I'm in the corner watching people, I don't enjoy being in the middle of a crowd. Too many voices, faces, conversations, and I end up just hearing pieces and not whole conversations. I'm with you, Julia. Crowed rooms, stores, streets bother me a whole lot more than they used to. Absolutely. I will bail if a restaurant is too noisy or has a line waiting for tables. I don't go to concerts at large venues anymore. The traffic isn't worth it. I have what I call social deafness. I can't hear people with all the noise around me. I've been thinking about how important it is to cultivate our pack of friends… We are all so busy and overscheduled, with so many commitments, it makes it all the more tempting to just stay home when you get a chance. I think when I was younger ( imagine tottery old voice) I did something social and sociable every night, can you believe it? Now it's either work, or a quiet dinner with another couple,, or…nothing. Oh, Julia know you are so right! Sometimes I feel like I'm invisible, and I just hold my ground and let everyone swirl around me, and then I take my turn. I was the eldest by 4 years, so I spent a lot of time alone growing up. By the time my siblings got to a stage, I was beyond that stage and on to the next one. So I had a lot of alone time and only a few friends. Hallie, your story of lunch resonates. Until high school when I had orchestra practice over lunch, I "floated" around trying to look like I was going somewhere, too. Now, I'm happy with people but like so many I have to unplug and recharge. I like sharing a room, but I need someone who knows when to just ignore me and not talk. Which is why the friend I'm rooming with next year for Malice and Bouchercon is perfect - she's exactly the same way. Julia, my tolerance of crowds and bustle has definitely decreased, not just because of age, but because I am uncomfortable with my mobility issues in large groups. I'm another both/and type. I love being with friends sometimes, and I crave alone time sometimes. Sometimes I think I depend on my wife too much for company, so I'm working on making more friends through my own interests to complement the many friends that we have through hers. Hub and I have separate friends and joint friends - it's interesting how it's evolved over time - with only a handful of crossovers. I am an only child, ran with a small pack in high school and college, got very sociable as I was raising children and working, and now, in my dotage, prefer my own company and Julie's, not very excited about anything else. One thing I do hate to do alone is eat out. Deb, I love that you can do that. I'd be eating takeaway in my hotel room for three weeks. In my neighborhood everyone knows everyone. Having been here only 17 years, I am a relative newcomer. During my morning walks I usually get all the socializing done that I need for the day! Mostly, given the choice, I prefer the company of small children and animals. It was, however, a treat to spend some time with (almost) all the Reds during Bouchercon. What a wonderfully inclusive group. And Jenn and Ingrid, I'm so sorry I missed you. Two people I ran into every day, several times a day, were Catriona McPherson and Ann Cleeves. As a dedicated fan girl, I was delighted to be recognized and hugged each time. How they do this is beyond me. I'd be hiding in my hotel room eating bonbons after a day of it. I've learned to eat out alone... because of all the traveling. What's nice is that now there's nothing weird about a woman sitting down at the bar and ordering dinner. You can watch the TV, check your email, read, chat with a stranger... or just be. Eating out alone isn't a big deal for me, which is good, since I'd pretty much never eat out at all if I needed company. I've also discovered that I love to go to movies by myself, which I used to think would feel weird. Is this THE most wonderful picture ever?! Yes. Yes it is! For the most part, I join those of you who have a foot in both camps. When I'm at cons (and boy, did I hate missing this most recent B'Con! ), I love spending time with my pals, and I adored being with three girlfriends on my recent trip to Paris. But. I need a good bit of alone time even in situations like those, or I get grumpy. Traveling and exploring alone is something I love doing - me and my camera. Agree with you that it's a wonderful photo! I guess I am more of a loner than anything else although I was part of a small pack in college. These days I prefer family and a few good friends and don't mind traveling or eating alone in restaurants (except when I encounter a condescending waiter who treats me like a poor sad thing because I'm alone). I'm basically shy and don't mingle well but I've gotten better recently in putting myself forward among strangers, as Ann can attest. Yes, the eating alone thing has its plusses and minuses. It's most fun when it's a treat, not a fallback. But you can read, and just be by yourself. A little down time like that can be so lovely. And Christine, you know how I feel about small talk. But the advice I got here from all you reds was so helpful! Hank, I agree that it's most fun when it's a treat. Christine, concerning "condescending waiters". I've discovered in "my dotage" (thanks for the term, Ann) that the younger the waitperson, the less condescending. I may be reading too much into their smiles and body language, but it strikes me as "cool, here's this old broad just enjoying her dinner. Wish my grandma would!" Lucy, it was lovely meeting you at Bouchercon. Rhys was the only one in this group whom I had met Before Malice and Bouchercon. I met Hank at Malice. I think I met everyone else except one at Bouchercon. You mentioned a sibling who is 11 months older. Lady Antonia Fraser mentioned having a sibling who is 11 months older or younger. She uses the term "Irish twins". That means you and your sibling are "Irish Twins". Re: pack animal or alone... Though I am a very social person, I often do things alone. Growing up as an only child, I learned how to do things on my own. When I was at Bouchercon, I was there by myself. I asked several authors if they wanted to meet me for coffee / tea in the hospitality room. Three accepted my offer and it was fun chatting with them! And it was fun meeting new authors in the hospitality room. I did get a chance to explore the city on my own for a few hours. It's fun to travel with my Mom or a relative. They are so fun to hang out with. Like Kaye, I love to travel with a camera. These days I use my camera phone. Yes Irish twins. My parents called us “the girls” which kind of left our younger sibs out. While I was at Bouchercon on my last night, I thought I was going to eat alone until my new friends at the next table saw me and invited me to join them. Jenn, it was so fun hanging out with you and Kate at the Bouchercon bar during the pub quiz. So fun chatting about King George the kitten. I gave you my idea for a children's story about King George the kitten when you signed my Hat Shop book. It was fun! Oh, and King Goerge says "Hi!" He loves the story idea - of course, he does. LOL. Wonderful to meet you and see you at the Reds panel, too. How did I miss the King George story? Or are you saving that for a future Reds post? Hi Jenn, happy to read that King George loves the story idea. The Red panel was so full that people were sitting on the floor! Did someone take notes from your Reds panel? I would love the chance to read the notes if someone did take notes. Hi Gigi, I follow Jenn on Facebook and Instagram so I saw cute photos of King George, a tiny rescue gray striped kitten. I'm very social and have different groups of friends, but I enjoy spending time alone and with my significant other. See you are the perfect mix! I'm so glad I'm not the only one saying both. My final roommate moved out this summer, and I'm loving living alone (although my condo is slowly becoming the mess I feared it would thanks to Hallmark ornaments all over the place). But I am trying very hard to get out of the house, too, and reconnect with friends I've let slide. So far, I'm failing at that, but I'm thinking about it. I find I can be very fickle. I'll have a weekend with nothing do to, and I'm looking forward to relaxing at the condo, and then suddenly when the time comes, I'm wishing I were out doing things with people. And when I do have plans, I wish I could just stay home. If I ever could get those two lined up, I'd be thrilled. Mark, I have a habit of saying yes to plans weeks in advance without factoring in the fact that I'll only have arrived back from the east coast the night before and will be exhausted. I need to get better at imagining how I'll feel on the day of rather than the day I accept the invitation! The Hallmark ornaments have been taking over the condo slowly but surely. Now that I don't have a roommate, I don't have to hide them in my room any more. Judging from this super select sampling, it seems that birth order (or the lack of it, in Rhys's case) makes a huge difference in pack preference. I'm an oldest, and enjoy my own company, until I don't. Then I'm happy to pal around with the crew, as long as the shopping is limited. Shopping with a group is not my idea of fun. Probably from raising three daughters, don't you think? Talk about a pack! The first time I ever had to eat dinner at a restaurant by myself was in about 1975, in New York City. I was a dress buyer for a small chain of shops here in Cincinnati, and it was my first solo buying trip, or maybe my boss had already gone home. At any rate, I decided to treat myself to dinner at the Russian Tea Room, just around the corner from my hotel. Being from the Midwest, I thought 5:30 was a perfectly reasonable time for dinner, but the restaurant was empty. And they sat me in the middle of the blasted restaurant, for spite, I'm sure, for arriving so early. (At least it wasn't next to the kitchen door, or to the restrooms.) I felt completely conspicuous. But I got over it. Now I'm perfectly comfortable reading a book during my dinner, no matter where I am in the world. Count me as both, too. I'm comfortable doing things on my own, like going out to eat, but I also love having company. At places like Bouchercon, I enjoy the camaraderie of so many like-minded people and going to dinner in large groups, and I equally enjoy small groups of two, three, or four. Sometimes I prefer shopping alone though, because I can concentrate better. But, sightseeing is more fun with others. Once, at a Romance Writers of America conference in Dallas, I sat down for dinner by myself when a woman I'd never met before walked up and asked if she could share my table. I said "sure" and we had a lovely conversation. I told her I thought she was awfully brave to do that, but she said she didn't like to eat alone, and figured we all had something in common since we were all at the same conference. It was fun! What a nice thing for her to do - and for you to say yes to. A good risk to take! When I traveled, it was with family members and tours but around home, I am fine on my own. I usually save eating for with my friends but do go to some places that I really like alone. At home, I'm usually reading, watching TV, gardening, etc. but sometimes I feel like calling, texting, or e-mailing someone just to connect. Being an introvert, I live well by myself. Going to restaurants, concerts, and travelling alone is correct. Bouchercon was a little overwhelming but it was so much fun and interesting. Volonteering helped me to mingle and meet most of the persons I wanted to meet. And when it was too much, I could find a respite in my room. It was perfect. Do You Heart New York? Rhys looks back on a Week of Extremes. Ready for the Changing Season? Small Talk! Can You Do It? Horrors! Will you be seeing IT? @WendallThomas: YOUR HANDBAG IS KILLING ME! @SuzanneChazin: "I made it up, I swear"